Training Ships allow young sailors to experience the rigors of sailing while under the supervision of experienced professionals. 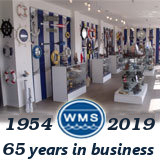 Handcrafted Model Ships is proud to offer the largest selection of museum quality replicas on the market, with the awe inspiring and legendary USCG Eagle leading the way. Each of these ships maintains all the hallmarks of classic sailing vessels, from the miles of sail rigging to impressive classic wooden ship wheels, ensuring that each sailor learns proper sailing tradition. Countless sailors have stood on the decks of these impressive ships, and many more will follow.